The Panama City Beach FL region has some of the most beautiful houses in all the country. A stones throw to the beaches and plenty of things to do for any age group, people from all over the world are flocking to this part of Florida to call it home. Regardless what time of year, the housing market is always booming, good if you are selling your home but bad for the potential buyers. Without the help of skilled local Panama City Beach FL real estate agents, your dream house could be gobbled up before you make an offer. Here are a few reasons to be working with an agent when buying a home in this area. When you are searching for a condo in Panama City Beach FL, be prepared to be running a sprint and not a marathon. No sooner do houses hit the market, many of them have a line of potential buyers already at the door making offers. It is not unlikely for a house to have a contract on it within a few days, shutting the door on anyone who is working without a realtor and using dated real estate magazines to find their dream homes. Your local real estate agent is an expert at finding specific listings and getting their clients in the door before the crowds arrive. Once you meet your Realtor, they will discuss your price range, house specifics, location desired, and how soon you are ready to move. By narrowing down the search the realtor will be able to locate houses within those parameters the minute that they hit the market. With the homeowners having their pick of potential buyers, it can be a real struggle for anyone without a realtor to get an audience with these sellers. The biggest issue is that these buyers do not have the skill or understanding in how to present an offer to the seller in a way that will be able to compete with the other realtors fighting on behalf of their clients. Most buyers without a realtor think they can haggle at the price, to discover they don't have a chance when realtors are bringing full price offers to the table. Without that insight from a realtor, the buyer has zero chance of getting the house. With the help of local real estate agents, you have a real fighting chance to get the house because of the way they present the offer on your behalf. Your offer will be fair, it will highlight your availability to close, and it will show your commitment letter from the mortgage company, something a seller truly appreciates in an offer. Once your offer is accepted by the seller, now comes the hard work for your real estate agent. Although you have secured the commitment of the seller, your real estate agent has to make certain that you are getting your money's worth. Just like when an agent is selling your home and has to make sure it is structurally sound, so too does the agent for the buyer. Your real estate agent is going to put you in touch with a number of home inspectors who will give the house a closer look and present you with a detailed report as to their findings. There will be an inspector checking the roof, plumbing, electrical system, foundation, and even for pests like termites. Once you have the reports in hand, you can decide if it is still in your best interest to move forward. Your realtor will also be in a position to consult with the seller's realtor about possibly having the homeowner make any of the repairs that were needed. Once the buyer and seller agree that the house is sound and that the sale can proceed, your real estate agent once again has to be hard at work to ensure everything falls into place accordingly. The agent has to balance the closing date with the real estate attorney schedule, make certain that all the formalities with the bank will be completed on the closing date, and that the seller is able to have all their affairs in order. While you are packing your belongings, your realtor is working hard to make certain every detail of the sale falls perfectly into place or the sale could be a bust. Having a skilled Panama City Beach FL realtor in your corner means that you will kept abreast of every detail of the buying process right up to the time you hand over the check and receive the keys to your new home. Now that the deal appears to be going through and your real estate agent has timed everything down to the last minutes of the closing, they still are there to help you transition into your new home. Maybe you are not from this region of Florida, or perhaps you are from another state. Your realtor will help you with connecting with moving companies, handymen, landscapers, and electricians. It is like you are moving to a new region and already have a friend who has some serious connections. 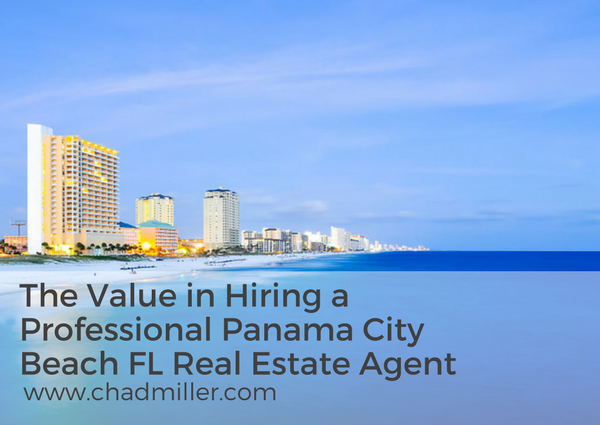 Your Panama City Beach FL real estate agent has made professional relationships in a number of areas, so if you aren't sure who to hire or use, there is a good chance that your realtor knows someone. Best part, these companies come highly recommended from a realtor you can trust. When it comes to buying a home in Panama City Beach, it is all about the timing. Your local real estate agent has the skills to get you into the houses you desire most, so you can be the first to present the right offer and start your new life in the house of your dreams.